Ferry crossings to and from the Island of Elba are easy and frequent, about every 30/40 minutes. 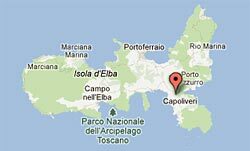 Once in Portoferraio, the port with most ferry crossings, take the main road for Porto Azzurro - Capoliveri. After about 10 km, you arrive at the traffic lights, and here you turn right for Capoliveri. Our hotel is about 150 metres further up.